Inflation on the wholesale level remained moderate in December, according to the Producer Price Index. The Bureau of Labor Statistics reported that the index rose 2.5% from the year before, unchanged from the rate in November and down from as high as 3.4% in July. The so-called core index, which excludes monthly volatile prices for energy and food, rose 2.8% from December 2017 – the same rate as in October and November. Lack of inflation suggests the Federal Reserve Board can be more judicial in raising short-term interest rates back to more normal levels. The four-week moving average for initial unemployment claims fell for the first time in three weeks and the fourth time in six weeks, as data settle from the seasonal irregularities of year-end holiday hiring. The leading indicator of firings and layoffs remains 38% below the 52-year average, where it has been each week since the beginning of 2013, according to Labor Department data. That suggests employers continue to be reluctant to let workers go, a sign of labor market strength that should help fuel consumer spending. The Federal Reserve reported that industrial production rose in December for the seventh month in a row, led by manufacturing. Mining output continued to grow. Utilities produced less in December as seasonally warm weather let consumers keep their thermostats lower. For the year, industrial production increased 4%, the largest year-to-year gain since 2010, the first full year after the recession. 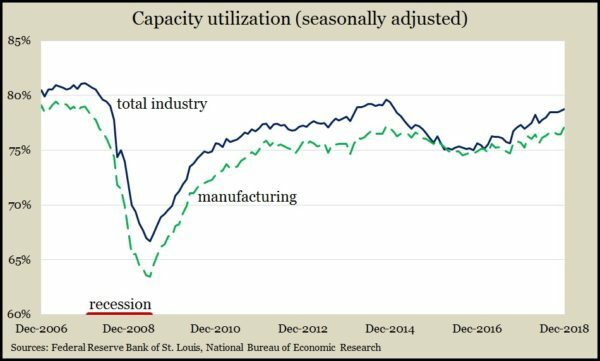 The same report showed capacity utilization, a leading indicator of inflationary pressure, rising to 78.7% – its highest point since January 2015, but it stayed well below its long-term average of 79.8% – which hasn’t been surpassed since 2008. 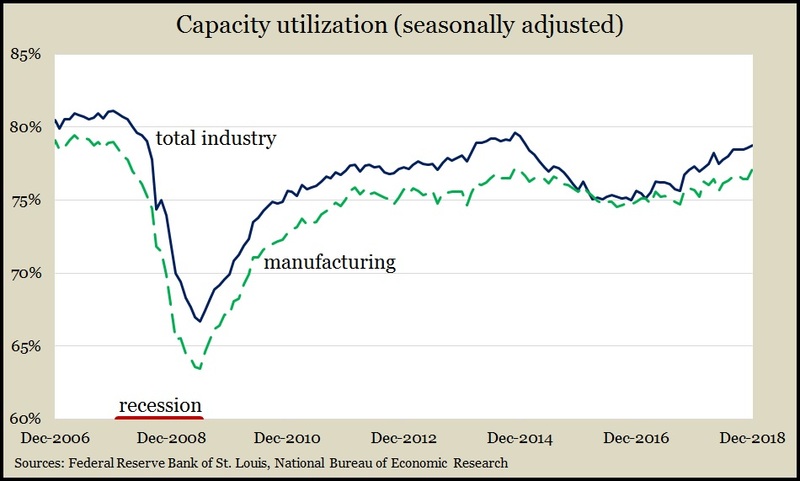 Manufacturing capacity reached 77.2% in December, below its 45-year average of 78.2%. A preliminary look at January consumer sentiment from the University of Michigan surveys suggests Americans are feeling less confident about the U.S. economic outlook. Overall sentiment hit its lowest level since before Donald Trump’s election. A university economist blamed uncertainties tied to such developments as the government shutdown, tariffs, financial markets, a global slowdown and Fed policies. Although personal finances support further consumer spending, lower sentiment could sow caution. Consumer spending accounts for more than two-thirds of U.S. economic activity.